AquaMare sea water nasal sprays Dr. Müller Pharma are helpful during the common cold, for the nasal mucosa cleaning and its immunity enhancement. 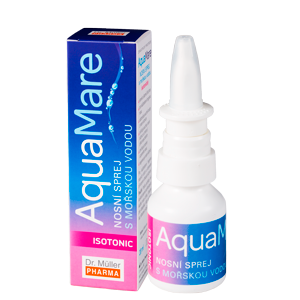 Due to its high content of mineral substances, sea water naturally maintains the physiological cleaning ability of the nasal mucosa. Suitable for adults, children aged 2 and up, pregnant and breastfeeding women.